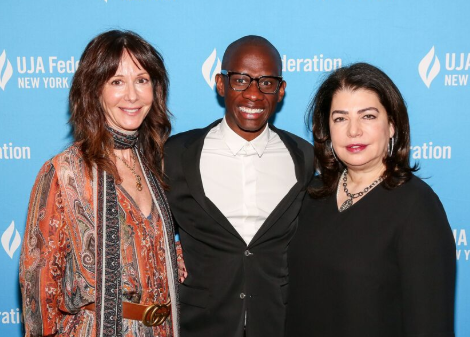 Philly was in the house when the UJA honored Spotify’s Troy Carter on Tuesday. 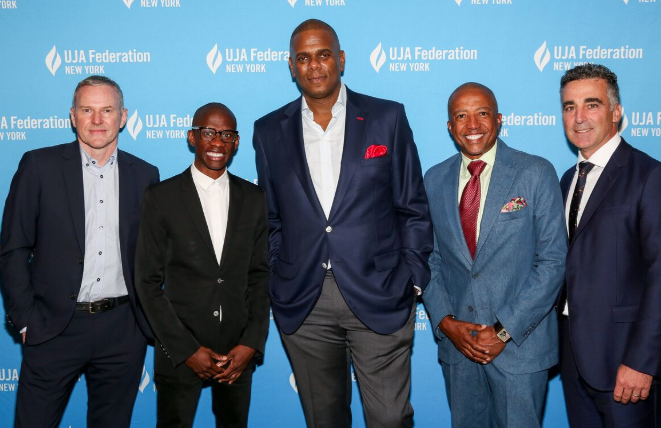 Legendary Sixer Julius Erving, DJ Jazzy Jeff and, in a surprise appearance, Patti LaBelle paid tribute to the Visionary of the Year honoree. Unfortunately, there were no cheesesteaks. Troy compares kreplach recipes with UMPG boss Jody Gerson and UMG EVP Michele Anthony. Carter, who referred to himself as an obsessive hip-hop and basketball fan when he was growing up in Philadelphia, gave props to the UJA for its charitable work. "It's important that the world knows what our industry does,” he said. His fellow honoree and boss, Daniel Ek, did not attend the event. “Swedes don’t like to take credit for anything,” Carter said before noting the two met in Ethiopia on a mission to ease the water crisis in the country eight years ago. The event, chaired by Daniel Glass and emceed by Empire’s Jussie Smollett, raised more than $1.2m for the organization’s efforts in dealing with the poor and the elderly in New York. Seen lining up for extra helpings of kugel were Sony’s Rob Stringer and Julie Swidler, UMG’s Michele Anthony, UMPG’s Jody Gerson, Warner Bros.’ Tom Corson, RCA’s Peter Edge, Republic’s Monte Lipman and Avery Lipman, Def Jam chief Paul Rosenberg, Barry Weiss, Jason Flom, L.A. Reid, Maverick's Greg Thompson, Rick Krim, Warner/Chappell’s Jon Platt, Danny Bennett, Recording Academy chief Neil Portnow and Charles Goldstuck. RCA's H.E.R., who Carter said is “a definition of what R&B is becoming,” and Columbia's Leon Bridges performed. Troy notes to RCA boss Peter Edge, Warner/Chappell chief Jon Platt, Kevin Liles and Republic's Avery Lipman that if they can find just five more execs, they'll have a minyan. 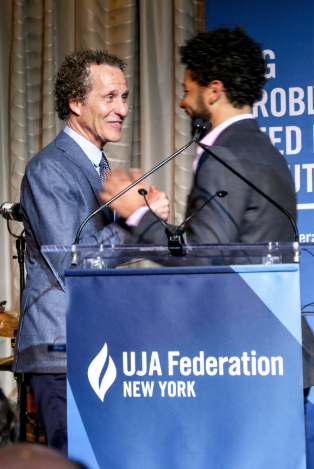 Event chair/Glassnote ruler Daniel Glass explains to emcee/TV star Jussie Smollett that the latter's name in Yiddish is actually "zaftig." Neither pursued the topic any further.